Democratic leadership released the statement in regards to the ongoing government shutdown. It began Friday night and midnight and won’t restart until Dec. 27 at the earliest. Recent reports say that the shutdown could last until early January. Instead off bringing certainty into people’s lives, he’s continuing the Trump Shutdown just to please right-wing radio and TV hosts. Meanwhile, different people form the same White House are saying different things about what the president would accept or not accept to end his Trump Shutdown, but her seems not to know how to get himself out if it. As long as the president his guided by the House Freedom Caucus, it’s hard to see how he can come up with a solution that can pass both the House and the Senate and end his Trump Shutdown. 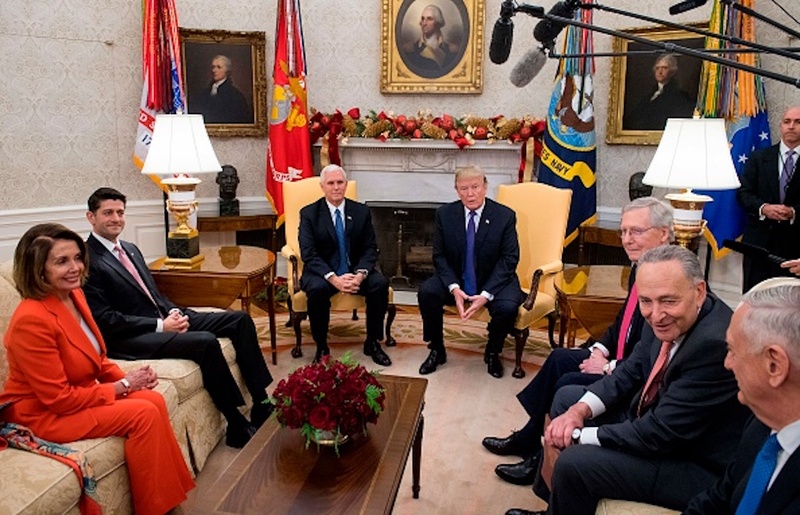 Earlier this month, Schumer and Pelosi met with Trump and Vice President Mike Pence to discuss the wall in a televised meeting in the Oval Office.